Book Description: This is a modular open textbook designed for entrepreneurial journalism, media innovation, and related courses. This book has been updated for Fall 2018. Let us know if you have adopted this book in your classroom! This is a modular open textbook designed for entrepreneurial journalism, media innovation, and related courses. This book underwent student and faculty testing and open review in fall 2017. Feedback was implemented in Version 1.0 for spring 2018. Additional reviewer feedback was implemented, and new chapters and sidebars were added, for Fall 2018. 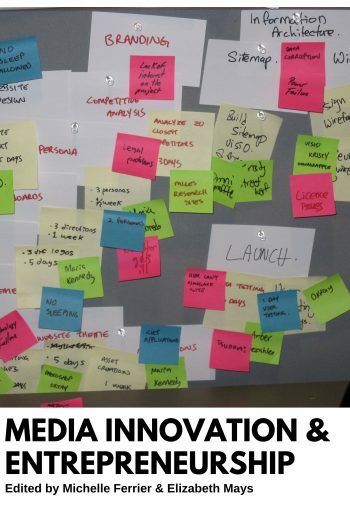 Eventually, an accompanying handbook will include additional activities, ancillary materials and faculty resources on media innovation for instructors. If you have a (CC BY) resource (or additional chapter) to contribute, please comment here. You can leave feedback on this book. ©2017-2018 Michelle Ferrier, Elizabeth Mays, Jake Batsell, CJ Cornell, Geoffrey Graybeal, Mike Green, Mark Poepsel, Jessica Pucci, Cindy Royal, Ingrid Sturgis, Betty Tsakarestou, Jan Schaffer, Abel Asrat, Rediat Belehu, Lori Benjamin, Dana Coester, Chris Dell, Dalton Dellsperger, John Dille, Amy Eisman, Francine Hardaway, Gretchen Macchiarella, Hodan Osman, Coury Turczyn, Georgann Yara. All authors retain the copyright on their work. Except where otherwise noted, all work in this book is licensed under a Creative Commons Attribution license (CC BY 4.0), meaning you can use it, adapt it, and redistribute it as you like, but you must provide attribution to the original authors, by retaining this license notice. Do you have comments about this book? Please visit https://forum.rebus.community/category/20/jmc-media-innovation-entrepreneurship-lead-dr-michelle-ferrier-ohio-university.